Thai Boxing (Muay Thai) has refined and defined from the ancient art of Muay Boran. This was originally a style of fighting designed for helping Thai soldiers defend themselves if they lost their weapon on the battle field. Using the hardest parts of the body, head, hands, elbows, shins, feet and even teeth to strike their and attack their opponent, it was nicknamed the art of ten limbs. Originally Thai Boxing fights were competitions held at local fares to allow soldiers a chance to practice and perfect their skills. In 1930 Muay Thai underwent a major transformation, a number of rules were introduced, including boxing gloves, groin guards & weight categories making it a much more humane and spectator friendly sport. A few years previously, fighters wore hemp rope wrapped around their hands & these were sometimes dipped in glue, when the glue dried it broke leaving sharp edges thus giving birth to the legend of boxers dipping their hands in glue and then in broken glass. Thai Boxing is the national sport in Thailand with two international stadiums in Bangkok hosting two fight cards every day between them and numerous smaller stadiums and events all over the country hosting bouts. Thai Boxing is also televised live on Thai TV and it’s very common to see large crowds gathering in cafes and bars to watch their favourite fighters competing. 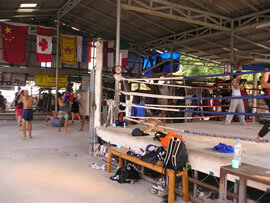 In Thailand the top boxers are revered in the same way as top flight footballers are in Europe. Now known as the science of eight limbs because you are allowed to kick, punch, knee and elbow any part of your opponents’ head, body or legs, it’s become one of the most exciting forms of ring sport in the world. Every mixed martial artist cross trains Thai Boxing as it is considered to be the most effective and real of all stand up martial arts or fighting systems.